Medical Bracelets to Jump Start the New Year! As the holiday season comes to an end, many of us realize how much of the time these past few months we’ve spent taking care of others and not focusing on ourselves. This new year, make your resolution one of health and the utmost safety by ordering a life-saving medical alert bracelet for yourself and for your loved ones. To begin, we at StickyJ Medical ID suggest getting started by first scheduling an appointment to see your primary care physician to see where your health stands. Also, schedule an appointment with an allergy specialist that you’ve been meaning to see and find out what it is that’s been causing your allergic reactions all your life. 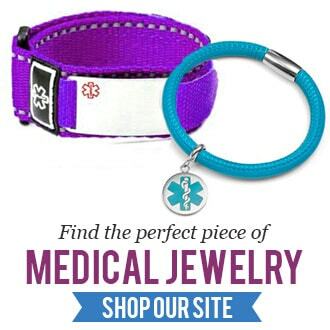 Once you know what you’re allergic to and what type of health condition you have, then you’ll be ready to properly order your custom engraved medical bracelet. Medical alert bracelets used to only be available in boring, clunky steel. Now, a medical alert bracelet can be made up of a few interspersed materials or just one. Popular styles mix classic leather and stainless steel medical ID tags to create a trendy, fashionable medical alert bracelet which can be worn with a variety of looks, plus the medical tag can be freshly laser engraved with your specific health information. Another popular style in medical jewelry these days takes natural gemstones and adds them to charm style bracelets to create a look that is appealing to both men and women. Gemstones are a popular choice because they’re attractive and you can select a type of gemstone which holds special meaning to you. Precious metals add a little something extra to medical ID bracelets as well. At StickyJ Medical ID, we provide a very large variety of gold including yellow and rose gold, plus sterling silver selections which can be finely etched to keep your important safety information readily available should an emergency situation arise. The finished look of a gold or silver medical bracelet is elegant so they can be worn with your most formal of attires. December 1st is World AIDS Day — Get Tested, Raise Awareness!